The confusion evident about one of the claims, that Iraq sought uranium from Niger despite having no civilian nuclear programme, is the latest example of the process under which the allegations made so confidently last September have been undermined. The CIA has admitted that the claim should not have been in President Bush's State of the Union speech. It turns out that the CIA and the British intelligence agency MI6 passed each other like ships in the night and did not share information. Correspondents attending a Foreign Office briefing last week were astounded when an official remarked that there had been no duty on Britain to pass its information on Niger, which it obtained from "a foreign intelligence service", to Washington as it was "up to the other intelligence service to do so." Apparently there is a protocol among intelligence services which could not be broken despite the grave nature of the information and the use to which it was put - in this case, to help justify going to war. Even a CIA statement of explanation issued late last week was not quite correct. It said that the President's famous 16 words were accurate in that the "British Government report said that Iraq sought uranium from Africa." Mr Bush did not in fact simply mention a British "report" on the uranium. He actually said that the British had "learned" that Iraq had sought these supplies. He therefore hardened up the position. Democratic Senator Carl Levin said on Sunday that this suggested intent by the White House to exaggerate the threat from Iraq. 1. "Iraq has a useable chemical and biological weapons capability which has included recent production of chemical and biological agents." No evidence of Iraq's useable capability has been found in terms of manufacturing plants, bombs, rockets or actual chemical or biological agents, nor any sign of recent production. A mysterious truck has been found which the CIA says is a mobile biological facility but this has not been accepted by all experts. 2. "Saddam continues to attach great importance to the possession of weapons of mass destruction and ballistic missiles... He is determined to retain these capabilities." He may well have attached great importance to the possession of such weapons but none has been found. The meaning of the word "capability" is now key to this. If the US and UK governments can show that Iraq maintained an active expertise, amounting to a "programme", they will claim their case has been made that Iraq violated UN resolutions. 3. "Iraq can deliver chemical and biological agents using an extensive range of shells, bombs, sprayers and missiles." Nothing major has been found so far. There was one aircraft adapted with a sprayer but its capability was small. 4. "Iraq continues to work on developing nuclear weapons... Uranium has been sought from Africa." The UN watchdog the IAEA said there was no evidence for this up to the start of the war and none has been found since. It is possible, though, that a case could be made from a shopping list of items needed for such a programme. These include vacuum pumps, magnets, winding and balancing machines - all listed in the British dossier. No details about these purchasing attempts have been provided. 5. "Iraq possesses extended-range versions of the Scud ballistic missile." No Scuds have been found. The British said Iraq might have up to 20, the CIA said up to 12. 6. "Iraq's current military planning specifically envisages the use of chemical and biological weapons." That may have been the case but direct evidence from serving Iraqi officers will be needed to prove it. 7. "The Iraqi military are able to deploy these weapons (chemical and biological) within 45 minutes of a decision to do so." The 45 minute claim is currently under question. It is said to come from "a single source" probably a defector or Iraqi officer. It has not been proven. 8. 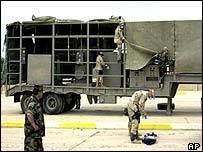 "Iraq... is already taking steps to conceal and disperse sensitive equipment." This is a focus of the current American and British investigation being carried out in Iraq by the Iraq Survey Group. One Iraqi scientist has come forward to say that he hid blueprints of centrifuges under his roses but that was in 1991. If a pattern of concealment can be established, it would add to the credibility of the allegations that Iraq wanted to defy the UN. 9. "Iraq's chemical, biological, nuclear and ballistic missile programme are well funded." Evidence will be needed from serving Iraqi officials backed up by documents. Again, if a pattern of funding can be established, a case against Iraq could be made but if the actual programmes did not exist, was the funding of much use and in any case, how much was it? President Bush and Prime Minister Blair will be meeting in Washington later this week when they will discuss their strategy to justify the claims. "George Tenet has been forced into an embarrassing apology"